Glock G40 Gen4 – GLOCKZILLA! USA – -(Ammoland.com)- At SHOT Show 2015, Glock unveiled a new pistol that flew a bit under the radar as people were clamoring for a Glock Carbine or a single stack 9mm. That pistol was the Glock G40 Gen4 in 10mm with a 6″ bbl and 9″ slide with the company's new MOS option (modular optic system). We might still be waiting on the carbine and the single stack came out just prior to the NRA show earlier this year in the form of the Glock G43 Handgun, so we decided to try out the G40. This model is the most powerful Glock pistol in existence and the biggest one the author has handled (the G41 in 45 ACP is the same size); so much so that we started calling it GLOCKZILLA at the beginning of the test period. For those who are unfamiliar with the 10mm round, here is a short history. Dissatisfied with the performance of the 9mm cartridge in the 1970s and 1980s, a round was sought that would replicate the ballistics of the 357 Magnum round in a semi auto pistol. The result was the 10mm, but due to the pressure of the round, most existing platforms could not be used. A larger framed pistol based on the CZ75 was the first candidate (known as the Bren Ten) and the 1911 frame was adopted in the form of the Colt Delta Elite in 1987. When the FBI decided to adopt the round, Smith & Wesson adopted their double action 45 pistols to chamber the round in 1989, Glock followed two years later with their G20 Pistol. Alas, the agents of the FBI found the recoil too harsh and a new round was created (40 S&W) with a reduced load and a shorter case that allowed the round to be chambered in 9mm sized pistols. The 10mm cartridge would have perished, had it not been for a large fan base that cherished the qualities of the round for hunting and the sheer power factor of near Magnum handgun performance in a semiautomatic pistol. We headed out to the range and set up targets expecting the Glock G40 Gen4 to perform like the author's Gen 2 G20: a lot of noise and felt recoil. We were totally shocked when the slide did not seem to rise at all. A variety of loads went through the pistol from lightning fast 125 grain bullets to heavy 200 grainers and not only was function flawless, but accuracy was impressive with groups averaging 1.75” at 50 feet. There was only one problem. 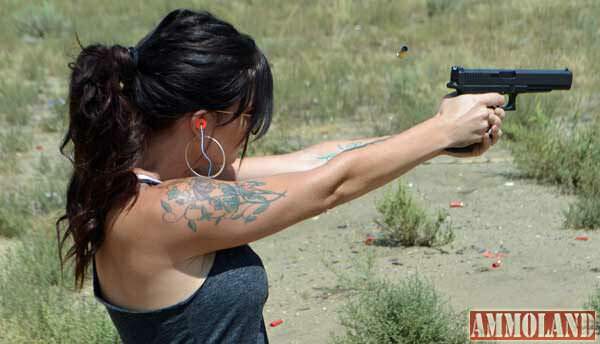 It felt like no other 10mm pistol we had ever fired with regard to recoil. Three decades of shooting on a weekly basis will probably numb you to most handguns, particularly if you shoot 45 ACP, 10mm, 41 Mag, 45 Colt and 357 SIG on a regular basis. So we were hesitant to mention this in a review until we let a couple of friends try the Glock G40 Gen4. They were shooters and only one was familiar with the 10mm round. Both stated that it felt more like shooting a 9mm. Not the answer we expected to hear when the magazine was loaded with sub-41 Magnum loads! There is a lot to love about this pistol if you are a fan of the 10mm cartridge. The grip frame is the SF (Short Frame) size to accommodate most hands and two larger back straps and two beaver tail extensions can be used to make it larger if need be. Glock triggers are often lampooned when compared to non-striker fired pistols and are often candidates for replacement, but the Glock G40 Gen4 trigger breaks at 4.5 pounds. Rather than replace it, we opted for a light polish on the inside. Perhaps the most significant improvement is the MOS system giving the shooter an option of a good number of aftermarket reflex type sights without expensive milling and of course being locked into one type. If the Trijicon RMR does not work for you, swap it out for a Leupold Delta Point in a matter of minutes. We regret that we did not get a chance to test with a holographic sight, but that may change in the near future. Finally, the six inch barrel gives enough of a boost to the 10mm cartridge to make it memorable. We do not quite put it in the category of the 41 Magnum class, (although ballistically it would match up to a similar cartridge fired out of a shorter barreled 41 Magnum revolver), but it definitely exceeds the power of a 357 Magnum with a bullet that is 1mm larger in diameter. That and you get 16 rounds as opposed to 6. If there is one drawback to the Glock G40 Gen4 or any of the MOS models, it is a number of extras you get with it. We have no idea how everything fits in the box, but there's 3 15-round magazines, paperwork, fired cases, a multilingual instruction manual, spare back straps and beaver tails, a tool for installing them, magazine loader, cleaning kit and 4 MOS mounting plates. Extras are not a bad thing, but finding a place to put them can be (lose that 43 mag loader and if you ever try to sell it they will ding you for $50 for not being “complete”). Luckily we had a spare old school Glock “Tupperware box” to stash the extras for safe keeping. A minor complaint may be the sights. As most Glock owners know, the factory plastic sights are “place holders” until you pony up for metal night sights. With a pistol like this running a factory rear adjustable sight, we feel Glock could have gone the extra step with a taller sight to co-witness with the optic. The G40 is the softest shooting 10mm pistol we have fired in over 25 years of experience with this cartridge. We believe this mostly has to do with the length and weight of the slide absorbing the brunt of the recoil. They may not have been the first company to build a 10mm, but the G20 was one of their first designs and they have stuck with the cartridge where many others have given up. The G20 is the 10mm handgun with the longest continuous production history on the market coming up on 25 years and the Glock G40 Gen4 is its younger and bigger brother. Glock has a winner with the Glock G40 Gen4, but the market segment will mostly be handgun hunters, 10mm fans or the Glock collectors who must have one of every model that Glock puts out. Glock touts it as a competition pistol, but we think that it may be too big for some league’s rulebook to be a serious contender in that market. 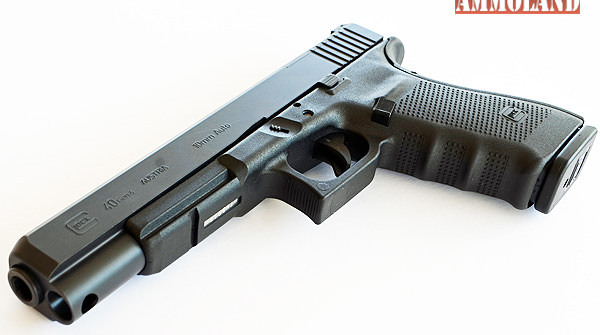 Most 10mm handgun reviews state that the round is not for everyone and this is true. However, the Glock G40 Gen4 may be an exception to that rule due to the minimal recoil impulse when compared to other handguns in that caliber. As a reviewer, the author gets to test a lot of firearms. Most of them are sent back to the manufacturer at the conclusion of testing. The Glock G40 Gen4 is the first review gun of any kind that the author has decided to buy for his own personal use. It is simply that good. Now all they need to do is build a similar sized model in 357 SIG. 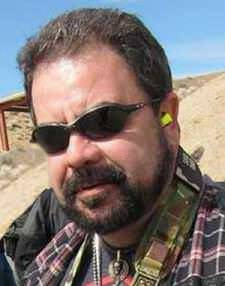 Mike has written over 2000 articles for a number of magazines, websites and newsletters including Blade, RECOIL, OFF-GRID, Tactical Officer, SWAT, Tactical World, Gun Digest, Examiner.com and the US Concealed Carry Association as well as AmmoLand Shooting Sports News. I downloaded the certified armorer’s part list from Glock’s website and could not find very many parts specifically listed for the Glock 40. Does the Glock 40 have any unique parts or can I use the parts listed for the Glock 20? Will this be a good woods gun? How would u compare recoil to glock 22 gen4? Have a 40 sub 2″ groups with s&s casting plated 165 gr lead in stock barrel,also bought wolf 40 s&w conversions.not quite as accurate but the flex of having different rounds is nice.nave 9mm conversion wolf barrel,you have to put 13lb recoil spring in.have not tested accuracy.2″groups at 25 yards. How come there are no tactical level II or III holsters for this Glock G40 weapon? Or did I miss something? I don’t want a molded leather holster with a leather strap and snap-button. I want a police level II or III holster that includes a hood and levers that will retain this weapon (even in a physical fight) until I need it. One correction. The slide on the 41 is a slim profile like the g30s just longer. The g40 uses the same profile as the G29, g20, g21. WHERE ON EARTH CAN I FIND A TACTICAL HOLSTER FOR MY GLOCK MODEL G40 GEN 4 MOS I HAVE RUN OUT OF PLACES TO LOOK! 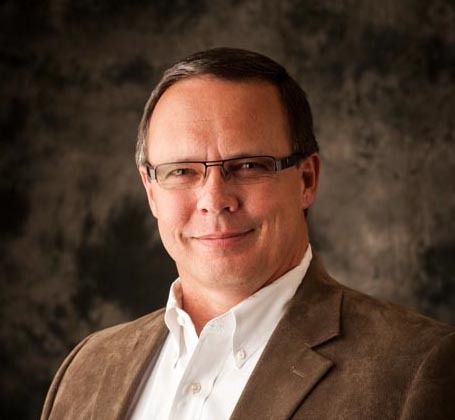 GUNFIGHTER INC. CHEST HOLSTER FOR GLOCK 40 LH OR RH HOLSTERS. THESE ARE OUTSTANDING HOLSTERS. A PLUS ALSO IS THE EAAWITNESS HUNTER IN 10 MM FITS IT ALSO. Glock 4 gen with vortex venom red and buffalo bore or double tap ammo beats my sw 686 stainless flawlessly. Your mom likes the 10mm and your grandma liked the .45 cal. I keep trying to find reviews on this gun and in each the accuracy seems appalling! Who even tests a hunting pistol at 15 yards? And 1.75 inches? A Bersa thunder 380 can do that with junk ammo? A Glock 17 will do that? Are they going to hunt big game on their big screen TV? Any gun should sub 2 inches at 20 yards, if not it is junk! I really wanted to get one of these, but most of the reviews appear to put this gun at the 3inch + grouping range at 20-25 yards with some ammo doing worse. Are these internet test site not experienced with guns or this the G-40 that bad of a gun? Who would try to hunt hogs or any thing that could not group in the kill zone at 50 yard? Most of these are getting optics? People do realize that a 44 magnum grouping 2 inches at 50 yard would be bad to some hunters? It says 50 feet–maybe a typo? I have the new Glock G-40 with raised Trijicon Suppressor sights front and rear & a Trijicon red-dot RMR for co-mingling alignment. BUT – I can not find a level 2 holster to fit this new gun. I have checked with all the holster makers that I can think of, and no one seems to make what I am looking for. Any Suggestions??? Try Diamond D Custom Leather out of Wasilla, AK. Great company, does work for military, + lifetime warranty. Not cheap but worth the dough! GUNFIGHTERS INC. KENAI CHEST HOLSTER LEFT OR RIGHT HANDED GREAT HOLSTERS. ALSO A PLUS IS THE EAA WITNESS HUNTER IN 10 MM FITS IT ALSO. I saved up and got a Glock 40 based on this article. Went to the gun shop three times looking at it before dropping $769 for it on the third visit. My first 10mm and was not sure what to expect. The Glockzilla was smoother than most 45s and way more pleasant to shoot than my old generation 40 caliber Glock. I could shoot the G40 one handed easily. It points very well and the recoil felt more like a 9mm to me. This is definetly the smoothest hand cannon I’ve shot. I love the good old 1911A1 in 45 ACP, and the Glock 40 has been the first gun that made me leave my 45 in its holster… and I will never look at my 9mms the same again! The big G40 packs 15+ 1 in 10mm… and after watching how accurately the big Glock drove rounds on target and seeing the massive shock and cavitation in the dirt/mud backstops I felt like it was a mini 308 in my hand. I was very impressed with how well this pistol handled and how comfortable it was to shoot, reliably and accurately. Definitely not a small concealed carry piece, but for powerful target shooting, hunting and home defense, this is an outstanding platform. The MOS sights are way outta my budget, but I found the standard sights combined with a sub-$100 laser sight works really well. Toltepeceño– i kind agree with your statement but not exactly. When i bought my Ruger 454 Casull ALL the guys in the gun shop said that i would not be able to shoot more than a full cylinder or 2 without hurting my hand/ wrist, some of those guys were bigger than me (at the time i was 5’11” and about 200 pounds… im up to about 250 now) I went through 200 rounds my first weekend and a lot of them were single handed. different people just handle recoil differently. I just got G40, (havent shot it yet because im in the middle east again) ive had a G20 for a while and i have shot the G29 with hot loads… i think its kind of a pussycat. I cant wait to get my hands on my G40 to go hunting with. Now i just need to figure out what reflex sight to use… ive never used a reflex before. Plenty of EOTechs, Aimpoints and ACOGS but never a real “reflex” sight. I have been shooting a Glock 20 for at least 10 years and I find it quite manageable to shoot. I reload and also have a fair size stock of the original Norma ammo. The 20 is the only Glock that I have ever been inclined to own, but this new longslide model is interesting and I might have to check it out. I would never consider owning the compact model 29 though, my hands are just way too large. I would probably have two fingers hanging off the bottom, and I have no use for it. When I carry, I carry large. Picked up my G40 couple weeks ago mounted Bueeis fast fire 3 awesome handgun, very sweet shooter.still have my20/C but the G40 is my go to firearm. IT IS UNBELIVEABLE!….ThANK YOU GLOCK. Picked my G40 up a few weeks ago…Sweet…went and placed an Insight MRMR 3.5MOA Red dot on it and its now my favorite gun to shoot. I own a G20 gen 2 and love it. I have large hands and put a Hogue overwrap on the grip. Feels really good. I am getting to be a really senior citizen and am beginning to have sighting problems. Put a Lasermax guide rod laser on and it really helps. Looks like all the grip options on this model would really help me. Any price info? ive been looking for a larger pistol for when I’m in grizzly country, (hourse back riding or archery hunting), would this pistol work? With some 230 grain double tap loads any grizzly should fear that you could release 15 shots in his direction. Of course, Mike, you actually just need the .357 Sig barrel for a GLOCK 35. I love the 10mm. So much so that I converted my G30SF to 10mm by a storm lake barrel and mag change. I have not experienced the abusive recoil that others have mentioned. The factory over the counter rounds are pretty anemic and not much hotter than.40 s&w. I handload and have loaded some max loads using bluedot and 2400 and 180g easily hit 1200fps. No daytime muzzle flash and no arm breaking recoil. I will say it sounds much different than most. Deeper boom more like a 44 mag than a 357 mag. I can’t wait to try one of these out and it is on my short list. You really need to back that statement up with something, otherwise , you just sound like sour grapes . What information brings you to this conclusion Saddletramp ? Have the G20C and the G20SF, they are my go to carry guns when I hike , fish or hunt. The best thing I like about the Glocks is, you pull the trigger they go “Bang”!!! … and who is this ‘Karen’ person? I would also like to know, she looks hot behind that Glock ! You didn’t tell us that you paid for it? I may just be blind… A day late and a dollar short though. Several years ago I bought a G29SF thinking it would be my carry gun. It was like grabbing a tiger by the tail. It was so tiny, you had to get a mag extender just to hang on to it. I could shoot it pretty well, but it wasn’t a pleasure. My Dad shot it once and handed it back to me. I hadn’t given up on the 10mm, but I sold it and got a full size EAA Witness. THis is a gun designed around the round. Sure it’s a CZ75 clone, but beefy. Aside from the tiny 29SF, it took about $100 worth of trigger work to get it where I liked. The guy that bought it from me loved that. I bet he’s sold the gun by now. A much smaller guy than me, he could grip it, but didn’t have the weight to counter the recoil. Looks like a nice gun, but I’m done with Glocks, I guess is what I’m trying to say. You’re “done with Glocks” because you bought a small 10mm that didn’t really fit you and had atrocious recoil? Hah! Yep, you’re right. I didn’t include enough information to support that statement. Being unable to find a range that had a G29 available to shoot, and having never fired a 10mm before, I should have been a little more diligent. When I buy a gun, I don’t expect to have to modify it to make it “usable”. Meaning something I would be comfortable carrying around. Unless I buy it as a tinkerer, I prefer it to pretty much do what I want outta the box. I don’t think that’s too much to ask. Things like the slide release, the trigger, a couple other minor annoyances. I prefer steel guns, and it took the Glock to make me realize that. I still need a small gun for carry, but it will most likely be a 1911 commander. I just got an EAA Witness, and although it fills a different role, it does everything I want a 10mm for, without any tweaking. When I bought the G29 1st time, I wasn’t really sure what I was going to do with it. But the don’t like Glock thing, since from what I understand they are built pretty much the same, I can safely say that (aside from the 40) I prolly won’t be owning one. Your statement on Glocks is a little broad. All I did to my 21 was have a 4 pound trigger installed, and that was just for USPSA shoots.. Other than that, I can shoot this gun accurately under a wide range of conditions, and having shoot it in USPSA comps, and spending several years in Iraq and Afghanistan, my EDC is a Glock 21. So, you can dis them all you want, but keep in mind that different guns fit different people and just because you can’t make it work for you doesn’t mean that other people can’t. Anyway, nothing delicate at all. When people ask me what caliber to buy, I usually tell them to get the biggest caliber they can comfortably manage. The only 9mm I have is a Makarov in my collection. I shoot 45 most of the time, but since 10mm is cheaper to make, I’m practicing with that right now. I would call me a wimp too, unseen. It’s just that pistol doesn’t agree with me. I’m sorry, but as someone that has reloaded a ton of 10mm to the max and shot a lot of 10mm guns including the g29 I have to believe you are either exagerating big time or very delicate. 10mm is not bad a.t all. Take it to the gun show!